The rise in popularity of traditional archery over the past few years has been a second coming in the archery world. Most archers who switch from a compound bow to a longbow or recurve model find the change to be challenging, but more rewarding. If you are thinking about switching to a recurve or longbow for hunting, there are a few traditional bowhunting basics to know before making the switch. Aside from the bow and arrows, there are a few pieces of gear you’ll need when switching to traditional archery. The three essential items you’ll need include an arm guard, finger tab, and bow stringer. 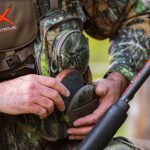 The arm guard protects your forearm from the string while shooting. With most new shooters, the string can graze your arm during shooting which can be extremely painful. The guard is also designed to keep sleeves or other loose material out of the way while shooting. Just as the arm guard protects your arms, the finger tab protects your pointer, middle, and ring finger while drawing back your bow. The tab is usually made from leather to protect fingers from blistering or cracking. The tab can either be a finger tab or a glove. The finger tab is a flat piece of leather and is usually attached to the middle finger. Alternatively, a leather glove can be worn if the tab is uncomfortable. Lastly, the bow stringer is an important piece of equipment. Any time you string or unstring your bow, it’s important to always use a bow stringer. There is a lot of tension on the bow limbs and the string once it’s strung. 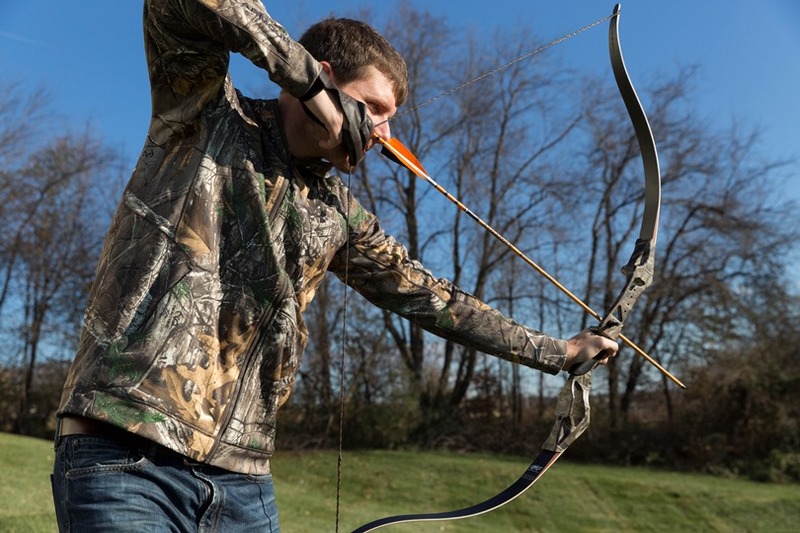 By not using a bow stringer, the tension could cause the limbs to break, or worse, the string can recoil and harm you. Depending if you are shooting instinctively, or using sights, your shooting form can vary. No matter your shooting form, you should always line your arrows up the same way every time. Typically, you should set it up with your odd color fletching facing away from the bow. This will ensure accurate shooting every time with enough clearance. If you knock your arrows the same way every time this will help you identify any oddities in certain arrows. Additionally, when knocking your arrow, make sure you load it below the knocking point. There is usually a small metal bead on the string, and the arrow should be clipped below it. This ensures the arrow doesn’t move up and down your string, and helps with accuracy. You should also choose and use an anchor point. With traditional bows, there aren’t kisser buttons like with compound bows. An anchor point can be whatever feels comfortable for you with your draw and hand placement. Usually, the thumb knuckle is placed on the back of the jaw bone just under your ear. However, if you have an anchor that works best for you continue to use what you’ve been practicing with. As mentioned earlier, if you are shooting instinctively (without sites) most shooters hold their bow at a cant. This is a more natural way of shooting, and allows you to see past your bow and to your target. If you are shooting with sites, you want to keep your bow as level as possible. Shooting a traditional bow on an angle, or out of a tree stand, can be a cause for concern since traditional arrows fly fewer feet per second (FPS) than those from a compound bow. Although it is less, it’s important to remember that your shooting form shouldn’t change. Shoot using your same anchor point, however if you’re shooting downhill, bend at the hips to angle your bow lower. You never want to adjust your arms or shoulders to compensate for angles. Your form should stay the same every time. The only area that should be adjusted is your hips if shooting downward, or when kneeling or crouching, if necessary. It’s important to note that when hunting with a traditional bow, your prey needs to be closer than if you were hunting with a compound bow. The optimal range is 20 yards or closer, as the arrow flies at a lesser velocity. If you are thinking about switching to a traditional bow, it could re-ignite the thrill of the hunt. The extra difficulty that a traditional bow provide takes hunting back to its roots, and as some people may say, “it levels the playing field”. If you’re still looking for an extra challenge, try hunting with a traditional bow. Nathaniel Dearolf is the Creative Director/Marketing Manager at October Mountain Products in Mount Joy, Pennsylvania. He is an avid outdoorsman and shoots traditional archery recreationally. Nathaniel works side-by- side with the product development team at OMP to assist in designing and engineering modern archery solutions. October Mountain Products is committed to building best-in- class traditional bows, bow cases, hip quivers, archery accessories and archery-centric products.